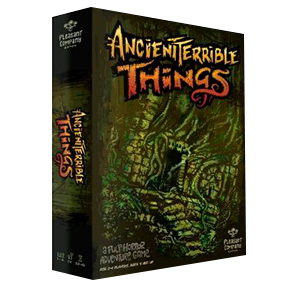 Occasionally you stumble across a Kickstarter campaign with irresistable appeal, and such was the case with Ancient Terrible Things by Pleasant Company Games. Creepy pulp horror them? Check. Artwork and design that called to mind old Tales From the Crypt/Vault of Horror EC comics? Check. Big chunky colourful dice? Check. After a bit of research on Boardgamegeek and a few good reviews, I was signed up to get myself a copy of the game and its expansion, The Lost Charter. Truth be told I’m not usually a huge fan of Yahtzee-like dice rolling games like this and Elder Sign; and when you get down to it this really is just rolling dice to get combinations. But this one is so well put together its charm wins me over. Players are characters travelling up a mysterious jungle river and encountering all kinds of Cthulhu-esque horrors. There are Swag cards to be bought, Feat cards to be played to give you dice roll advantages, achievements to unlock, and resources to gather, and smeared generously over everything is a thick layer of theme. Fail the encounters (ie, the dice rolling combos) and you’ll be forced to take Terrible Thing tokens from the board, which count as negative points and push the game nearer to its conclusion: the Unspeakable Event. What’s that? Well, I can’t possibly speak of it can I?! Ancient Terrible Things is fun, easy to play and occasionally very frustrating! A great little game made with care and definitely worth grabbing and rolling with.